Nathaniel Cooper designed these business cards for Oak 63, a relaxed French bistro featuring a southern French-style menu in Kansas City. The identity is classic, with historical character, but also an edited, contemporary expression that doesn’t attempt to recreate southern France, but instead evokes the feeling of a fall day in the French countryside. 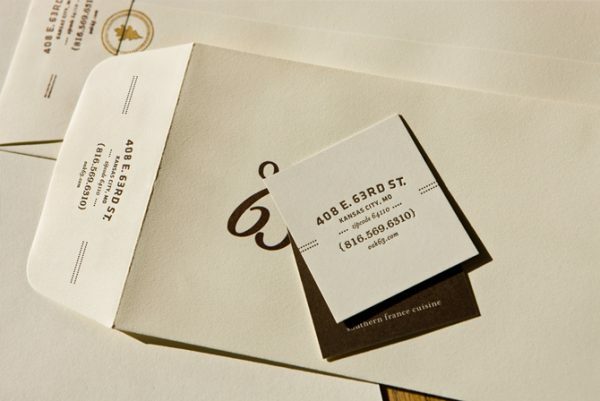 Hand-worked printing techniques were applied to the cards — stamps, letterpress printing and screen-printing —to infuse the relaxed and friendly personality of the restaurant. Overall, an effective minimal card design that makes all the necessary information stands out with clarity!